To shed some light on how I colorize old photos, I made a quick video to explain how I handle skin tones. Unfortunately, it won’t be of much use to someone who’s never opened Photoshop, but it should be useful for any regular Photoshop users who need to be pointed in the right direction. For all I know there are better methods, but this is my current go-to. As for the colors besides skin tones, it’s usually just a matter of guesswork and experimenting with blending modes. Colorized pic of my Dad and Uncle washing the Ford in the `50s. Hey, haven’t done one of these in a while. 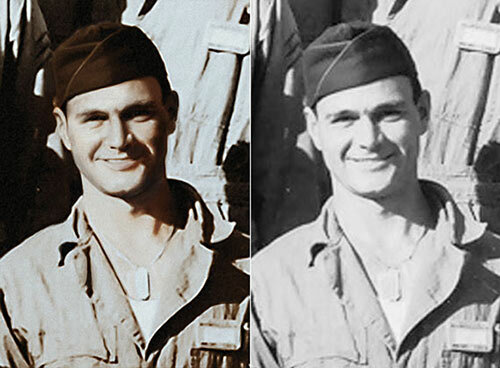 I was watching a video on using gradient maps in photoshop, and realized it was a technique I’d never tried for colorizing photos. Turns out it works pretty well, and you can easily toy with different color schemes. Thought I’d switch gears today and work on a litte photo restoration. This is a portion of a yearbook photo from the 1970s, when Tata came out of retirement to become a high school teacher. It’s not that the photo is in bad shape, but it’s printed in a low-res halftone, so there’s not a whole lot of detail. I thought it’d be fun to try to recreate what the original photo may have looked like. To guide me, and to salvage some of the tone, I started by blurring the original photo to the point where you can’t see the dots. Then I painted back in the details by referring to the original. Obviously I’ve got a ways to go before it’s passably photorealistic, but I’ll continue plugging away. Today my Aunt Susie sent me a great photo of Nana, age 24, around the time she moved to California from Mexico. Click the gallery below to see the before and after. You’ll have to forgive my brief detour into photo restoration; it’s always been a fascination of mine. 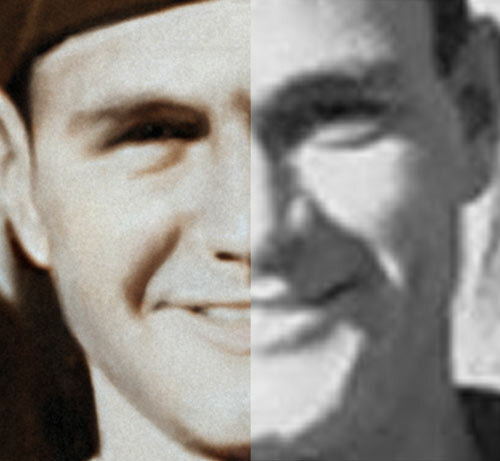 While coloring Grandpa’s photo the other day, I wondered if I could subtly add detail to photos, or even restore damaged photos, by painting. 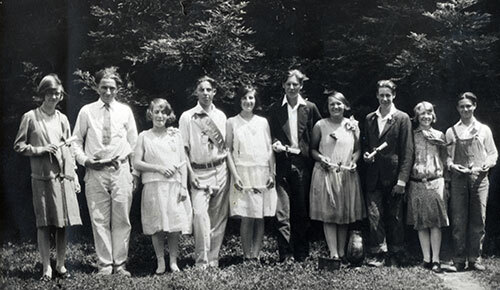 This photo of Tata (my other grandfather) is from the 1920s–a detail of a group shot of his middle school graduation. It’s not damaged, but there’s not a lot of detail in the faces. So tonight I did some experimenting. First, I painted a minimal amount of detail, using a clearer photo as a reference. Then I blended it into the original photo by adding some grain and reducing the opacity of my strokes a bit. What I like about it is that when viewed from a distance at actual size (as with a typical framed photo), it looks about the same as the original. But if you examine it closer, there’s a little more detail and expression. Next, I’d like to try an actual damaged photo; you know, one of those where important bits are completely missing and need to be painted back in. You’re right, this isn’t a sketch or drawing, but Grandpa warrants an exception. Besides, when I do these colorizations, I end up using a lot of the same techniques as I do when I paint digitally. I know the conventional wisdom is that colorization is unnecessary and usually cheesy, but one of the reasons I enjoy it is that it’s like opening a window into the past. Sure, it’s not perfectly realistic, but it gives me a little impression of what Grandpa looked like about 58 years ago when he got up and went to work. It’s also fun to do the necessary research to get the colors right (no guarantees that I did).